Cleveland's E 4th is an artsy and eclectic location for any photo shoot. It's brick lined streets and store fronts are historic and unique. Many bride and grooms select the E. 4th area for both their wedding and/or engagement photography. This image also had the element of a rainy down pour. You can actually see the rain flowing into the street from the sidewalk. 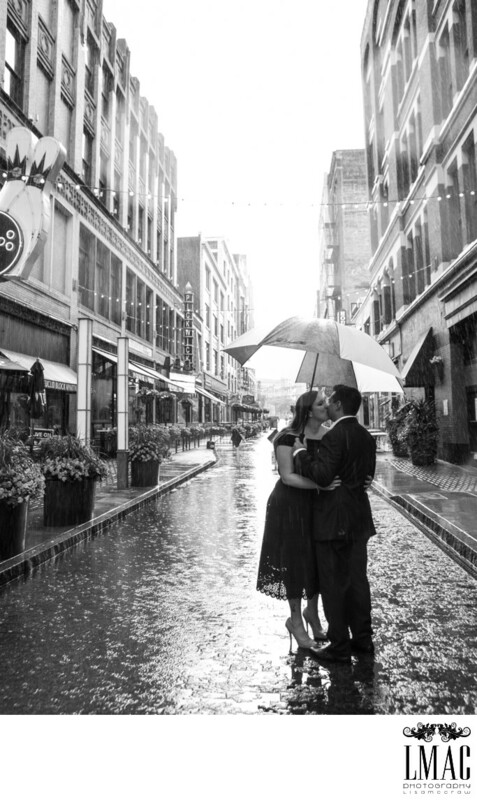 This bride and groom was a champ and unafraid of a little rain and this gorgeous engagement photo is the end result. Add a little black and white drama and it's an absolute winner. It's also important that brides and grooms select attire for the engagement session that reflect them as a couple. The formality of their clothing is the perfect compliment to the city street. Location: 2071 E 4th St, Cleveland, OH 44115.